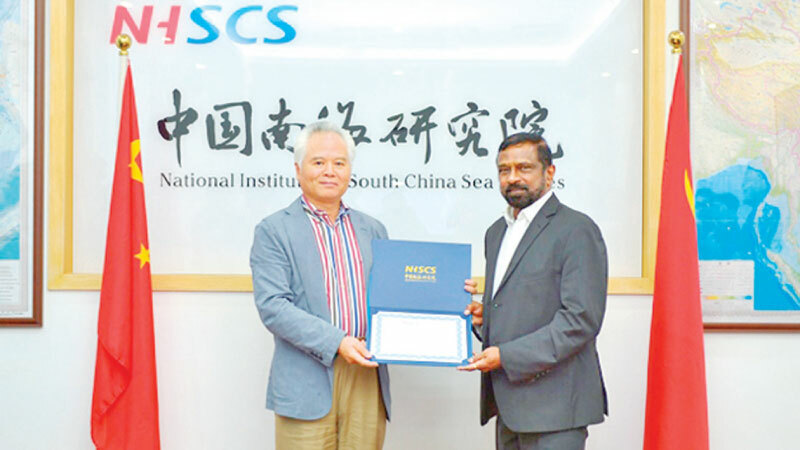 Director of the Centers for ‘Indo-Lanka Initiatives’ and ‘Law of the Sea’ of the Pathfinder Foundation (PF), Prof. Jayanath Colombage was awarded an ‘Adjunct Professorship’ by the President of the National Institute of South China Sea Studies (NISCSS), Dr. Wu Shicun, at the Institute’s headquarters in Haikou, China. The Centre for Law of the Sea of the Pathfinder Foundation recently established a working relationship with NISCSS, enabling both institutions to engage in joint studies on matters relating to Law of the Sea and other related maritime affairs. The NISCSS specializes in research on issues relating to the South China Sea (SCS) and participates in related academic exchanges. Its predecessor, the Hainan Research Institute of South China Sea (HRISCS), was established in 1996. In July, 2004, the State Council upgraded the HRISCS to national level and changed its name to the National Institute for South China Sea Studies. In order to promote studies on SCS and improve academic network, the Beijing Office of NISCSS was established in January, 2013. After nearly 20 years of exploration and development, the NISCSS has formed a systematic scope of research Including the strategy of the SCS; the geopolitics of the SCS, including neighboring countries’ policies on the SCS; international law and the SCS disputes; resources development and environmental protection in the SCS; strategies, institutions and mechanisms for developing maritime economy and the building of the maritime silk road in the 21st century. The NISCSS is composed of six sectors: Research Centres for Oceans Law and Policy, Maritime Economy, Marine Science, Maritime Silk Road, Division of International Exchanges (including the Beijing Office) and the Administrative Office. The institute has over seventy staff members and fifteen part-time senior research fellows, all of whom are eminent scholars from domestic and foreign universities or institutions. Admiral Colombage was seconded to the NISCSS to undertake a joint research project on the ‘Free and Open Indo-Pacific Strategy and its implication to the maritime security and maritime governance of the Indian and Pacific Oceans’. The two institutions are planning to conduct an international seminar on maritime security and governance in the latter part of the year.